The Vice-Chancellor, Professor Kolawole Salako, recently delivered a glowing tribute in honour of Africa’s foremost Diplomat and a former United Nations Secretary General, Kofi Annan during the Session of Tribute and Celebration of Life of Kofi Annan as well as formal inauguration of Africa Progress Group, at an elaborate event held at the expansive International Conference Centre, Olusegun Obasanjo Presidential Library (OOPL), Abeokuta. 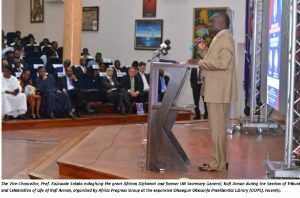 In a tribute titled, “From Millennium Development Goals to Sustainable Development Goals: Sustained and Sustainable Legacies of Kofi Annan”, the Vice-Chancellor noted that the tribute to Kofi Annan was not from personal knowledge, saying that which University anywhere in the world did not know the 7th Secretary-General of the United Nations who was at the helm from January 1997 to December 2006. 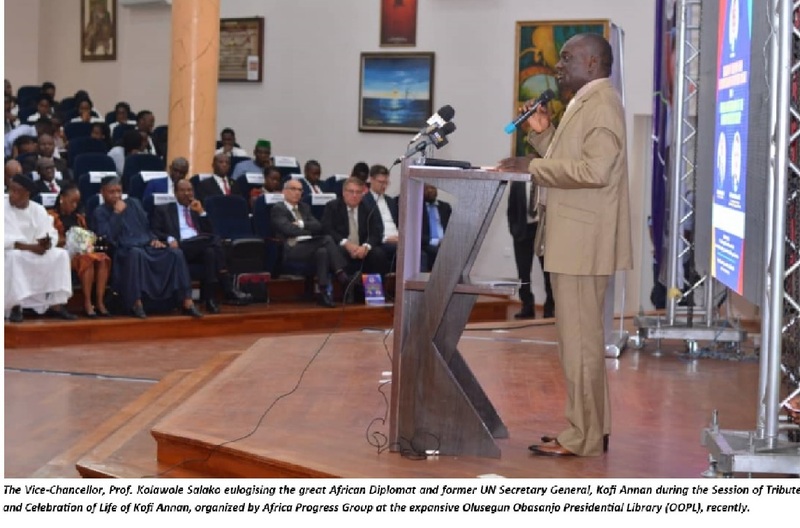 Eulogising the former Ghanaian High Ranking Diplomat, Professor Salako stated that “Did we not know or work with the Millennium Development Goals (MDGs)? Did we not know or work with the Sustainable Development Goals (SDGs)? Yes, we knew Kofi Annan because his Goals became our Goals. ‘We the peoples’ as Kofi Annan would keep re-emphasising, know ‘the peoples’ who must be lifted through quality education. The Vice-Chancellor therefore stressed that as a University, “We strive to provide the best of quality education. Our charge, as a University, includes teaching, research and community development. Being guided by MDGs and SDGs, we have been contributing our quota in the area of food security and eradication of poverty”. Juxtaposing the MDGS and SDGs with FUNAAB’s goals, the Vice-Chancellor said through partnerships, the University has contributed in the last decade in making cassava not just a food crop but an industrial crop that provides food for farmers and keeps money in their pockets. 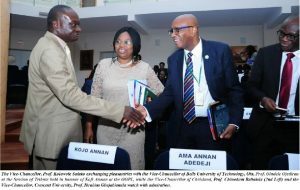 According to him, “We have found ourselves as a University being guided by the Goals, contributing our quota in eradication of illiteracy and in developing rural communities. We have been part of the measurable indices of development enunciated by the Goals while focusing on our Tripodal mandate of Teaching, Research and Community Engagement”. Professor Salako while concluding the tribute said that “Men with well-established legacies do not die. Kofi Annan is very much alive because his life was a life that influenced billions of lives. Rest in peace, Kofi Annan”. Meanwhile, Kofi Annan who was a recipient of the 2001 Nobel Peace Prize was born on April 8, 1938 at Kumasi, Ghana and he died on August 18, 2018 at Bern, Switzerland. Dignitaries present were the President, Republic of Ghana, H.E. Nana Akufo-Addo; former Nigerian President, Chief Olusegun Obasanjo; former Prime Minister of Italy and former President, European Commission, President Romano Prodi; Kofi Annan first son, Kodjo Annan as well as the Governor, Ogun State, Senator Ibikunle Amosun. Others were the Vice-Chancellor of Bells University of Technology, Ota, Professor OludeleOjediran; Vice-Chancellor, Chrisland University, Abeokuta, Professor ChinedumBabalola and the Vice-Chancellor, Crescent University, Abeokuta, Professor Ibrahim Gbajabiamila as well as several Student Union leaders from Universities across Africa.